As Arizona Highways contributor Craig Childs will tell you, going from the Colorado River to the rim of the Grand Canyon is the ecological equivalent of walking from Mexico to Canada in less than 10 miles. Plants, animals, weather ... they all change dramatically as you gain elevation. There’s no journey like it on Earth. But you can’t do the Canyon in a car. Down south, however, there is a vehicle-friendly version of this ascension through the ecosystems. 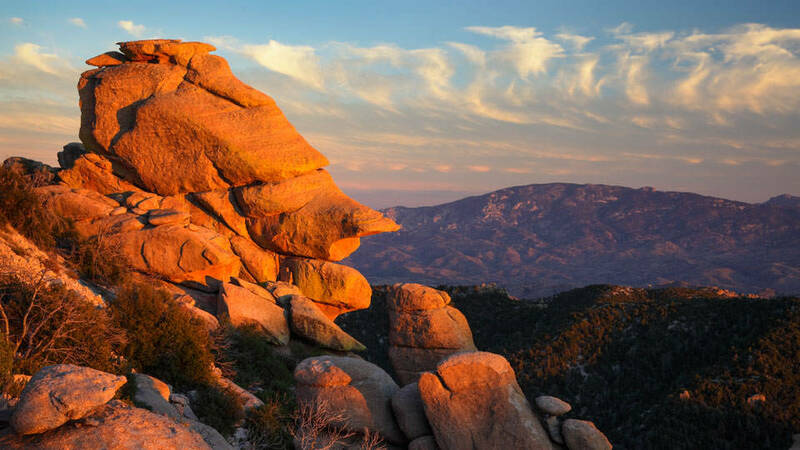 The Catalina Highway, also known as the Sky Island Scenic Byway, climbs Mount Lemmon, the highest peak of the Santa Catalina Mountains. You won’t get all the way to the 9,100-foot summit on this drive, but don’t be surprised if the temperature at the end is 30 degrees lower than when you got into your car. The 30-mile drive begins at Tanque Verde Road in Tucson, and the first few miles are mostly flat. The desert vegetation at the outset is typical of the Sonoran Desert, but once you begin the climb, you’ll see hillsides crammed with saguaros, which appear taller and thinner than those along, say, Interstate 17 north of Phoenix. It’s likely that some of them have been on these hills for 150 years or longer. But before you’ve had time to really ponder that, the saguaros give way to scrub bushes as the road heads uphill. Numerous pullouts and vista points line the route up the mountain. They’re all beautiful and worth a look, but if you’re in a hurry, there are two in particular you’ll want to hit. The first is Windy Point, about 18 miles into the drive. The view of the Tucson area is spectacular, and it’s easy to see why this vista is a popular wedding spot. Just beyond that point, near a sign marking an elevation of 7,000 feet, you’ll see your first ponderosa pine. Those tall trees become the dominant vegetation for the next several miles. Before long, aspens start appearing along the road, and at Mile 27, you’ll see a stunning panorama on the right. Aspen Vista Point, the other can’t-miss stop on the drive, offers the first great look to the north. An interpretive sign here spells out the wonder of this drive: From start to finish, you’re passing through six vegetation communities, starting with the Sonoran Desert and ending with a mixed-conifer forest. In between is a mix of grassland, woodland and forest. From Aspen Vista, it’s only a few more miles to Summerhaven, which marks the end of this drive. Although the Aspen Fire of 2003 burned a portion of the village, the community is as vibrant as ever. When you’re there, stop by the Cookie Cabin for dinner or dessert. And enjoy the cooler weather. Even in September, you might need a sweater. Directions: From the intersection of Tanque Verde Road and Catalina Highway (also known as General Hitchcock Highway or Sky Island Scenic Byway) in Tucson, go north on Catalina Highway for 30 miles to Summerhaven.